RSS or “Really Simple Syndication” is a form of dynamic news feed that is constantly updated. Use scrolling vertical or horizontal tickers to keep your viewers engaged. Choose from dozens of RSS feeds like news, politics, sports, health and others. Customize it anyway you like with fonts, gradient backgrounds, scroll speeds and others. You can even enter your own custom text message and have it scroll through any screen division. Get full 5 days forecasts including current conditions, today’s highs and lows. No need to subscribe to an expansive weather feed, simply drag and drop your favorite weather template, enter a city or zip code and you’re done. We support fully customizable weather including animated vector based icons. Embed a live scrolling vertical or horizontal stock ticker. Choose your favorite stock symbols and select from dozens of customizable properties such as today’s highs, lows, percentage change. Choose from pre-made stock scenes or customize your own, it’s all possible with the stock component. Want to integrate Live TV into a selected screen division? no problem. The mediaTV component supports full HD analog and digital input. So you can insert any S-Video, HDMI, Component or composite video signal into any selected screen division; all powered by a super smooth GPU rendering engine, so it always looks great! Whether you want to upload JPG, PNG, or Flash SWF images, locally or point to link across the web, it’s all doable with the Image component. We also support transparent Vector and Bitmap Flash SWFs and PNG resources so you can create beautiful masks which overlay your Digital Signage presentation. Also included are hundreds of backgrounds and masks designed by our team of artists, so you don’t have to be one. With the Catalog component you can flip through thousands of items / products while displaying their description and image. Best of all you can set all this up in a matter of minutes. The catalog is a powerful database engine that supports the ability to cycle through a list of items while combining animation and customization. Integrate it with the Kiosk Builder and have your viewers interact with your product list. Smile you’re on camera. Use the Camera component to integrate real time self portrait right onto your Digital Signage presentation. You can even take advantage of the cameras in your favorite Android or iPad tablets; we support both back and front facing cameras. Keeping time is easy with the fully editable Date/Time component. Simply drag and drop the Date/Time component to the timeline and set any format you like, pick your favorite fonts (over 700 to chose from), colors and Date/Time format; it’s so easy and looks great! Don’t want to host your content with us? No hard feelings. In fact, with the External link component you can host your videos, images, and SWF animations on any web server (even within your LAN or VPN). Simply point to the URL and let it stream down to the SignagePlayer. The best part is that all your content is still cached on the local SignagePlayer, so an interruption in the connection doesn’t interrupt your audience. Have some Analytics to showoff? Well with the Graphs and Charts components you can do just that. Add your data directly into the SignageStudio, pick from dozens of charts and graphs and let your data shine across your Digital Signage network. HTML5 is revolutionizing the web with great animation, Ajax and new capabilities never before possible with HTML. Take advantage of your existing skills and build animated clips or a fully interactive Kiosk, and run it seamlessly across all your SignagePlayers. Enjoy super smooth GPU accelerated HTML5 on Android tablets and phones as well as on Apple iOS powered devices including the iPad and iPhone. Flash is by far the most adopted animation tool in the known universe. With SignagePlayer you can run any Flash powered SWF. And it doesn’t matter if it was developed in Adobe Flash or in 3rd party Flash generator, if it’s flash based, the SignagePlayer will eat it up. You can even take advantage of Stage3D and build super smooth high definition GPU accelerated content; its all supported. Take advantage of high definition H.264 encoded video and run multi threaded pipelined content that looks great every time. You don’t need to install any special software codec and don’t have to jump through hoops to make it all work. Simply choose FLV or MP4 as your video format and watch people go “wow”. With the Custom RSS component you can bind to the same syndication as with the standard RSS ticker component. However with the Custom RSS component your content will not slide vertically or horizontally, Instead you can custom place the RSS items within the Scene Editor. Custom RSS is all about more flexibility and more customization. Get social! With the Twitter component you can expose your screens to your favorite @users and keep the data relevant, all the time. Let your viewers engage with the content and allow end users to push custom messages to your screens, without having to learn any new tools. If it looks good, use it. The YouTube channel is bombarded everyday with free great content. Plug right into this endless stream of fresh raw video. YouTube is a great way to keep your screens entertaining without having to subscribe to expansive content aggregators. And who knows, maybe your Digital Signage network will go viral! Do we have to say anything else? Come on, it’s Facebook! The PDF format is great as it is based on a vector based document that can scale nicely to any screen size. With the PDF component you can integrate any PDF document right onto your presentation. You can also save your favorite Microsoft Word and Excel docs as PDF files and upload them as well. The XML Player component is probably the most flexible component we have. It allows you to load any custom XML data in ANY format. So whether you want to load information form a PBX phone system or from your own private database, no problem. Just create an dynamic XML data feed and use our standard E4X parser to bind to specific tags within your “invented” XML structure, now how cool is that? With the Kiosk builder component you can create a navigational menu system. So you can drag buttons, elements and images to set target destination for each one. The Kiosk builder supports any touch screen including Android tablets and the Apple iPad. So now it’s easy to build a Wayfinder, Interactive information kiosk, visual paging and building directory just to name a few. The QR code generator is a quick and easy way to help your audience link the Digital Signage content to their mobile phones. Simply generate QR a code, place it on the timeline and push it down to your remote SignagePlayers, it’s a no brainer. Use the Form component to build a custom entry screen and collect information from your audience. Once the information is entered, pass it to a web server so you can store the data and redirect the user to a thank you page. The Advertising Engine is a robust tool that allows you to manage thousands of Ads across campaigns and businesses. The Ad Component associates a particular timeline as an Ad Capable spot so you can push Advertisements to the assigned screen division. Do you know how to program? Want to add your own component? No problem, you can do that. The software Development kit exposes the entire code base so you can develop a custom SignagePlayer component including a custom properties tab within the SignageStudio. 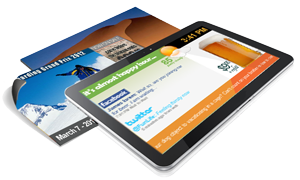 The SignagePlayer Mobile version was designed as a fully capable, light weight Digital Signage Player; in fact the entire SignagePlayer install size is about 1.5MB. 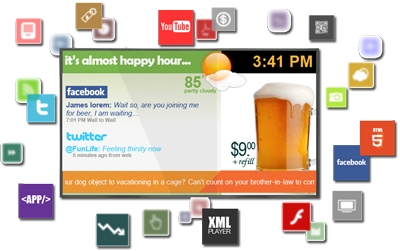 So you can harness the power of the Digital Signage components across all your screens, regardless of which operating system you use. The best part is that it always looks great just as you expect it, so if you added a Weather component and set your zip code, you can expect the same results regardless of the device you use, simply build it once and it runs everywhere!